To be honest, this is a composition of several different photos, all taken by me, but just combined together. So although the combination is not natural, all the images are. 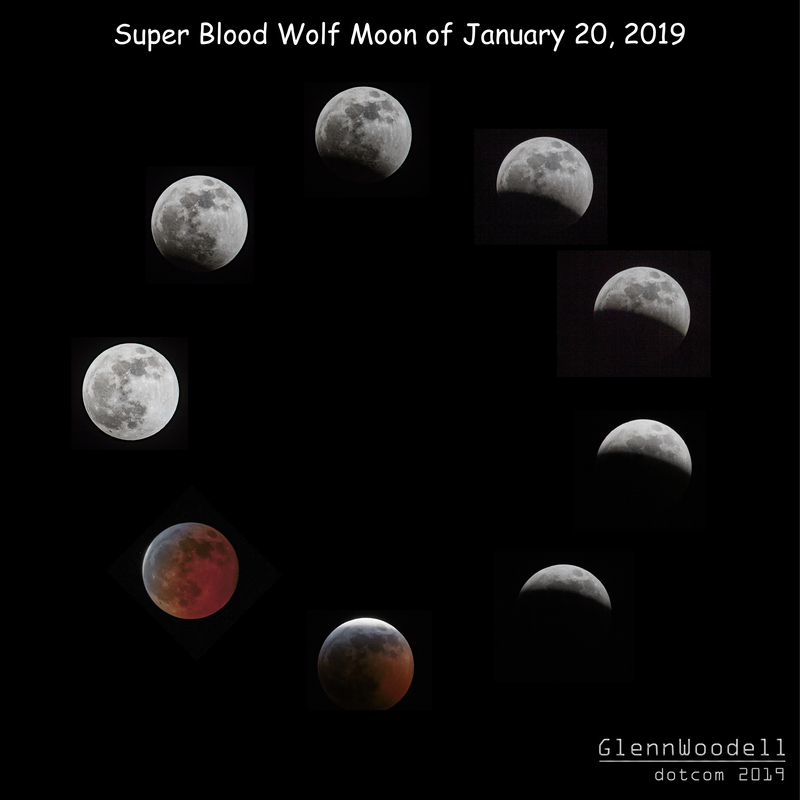 The eclipse of January 2019 was to be a super blood wolf moon and was to happen around midnight, placing the moon pretty much directly overhead, and therefore making it difficult to capture it against many of the common scenic hot spots in the area. So I decided to capture the eclipse sequence at home and then add it to a scene afterward. The super part meant that it was at its closest approach in its elliptical path around the earth. The blood simply refers the reddish color of a total eclipse when the umbral shadow completely covers the moon. The wolf is simply the name of the January full moon. 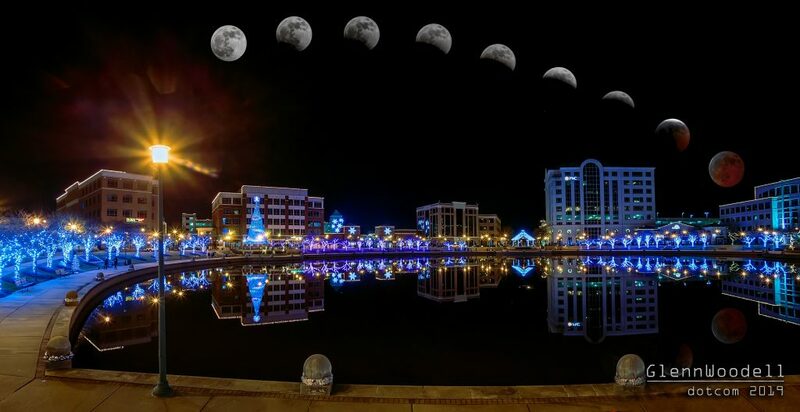 After trying several background scenes for composition, I chose one I had taken about a month earlier, at the local city center in Newport News. It was Christmas and the decorations and lights were still up. The stillness of the wind made for perfectly flat water which I figured I could use for a little reflection to make it more believable. I shot it with a Canon 1Dx and a Canon 15mm/f2.8 fisheye lens. Of the many stills I shot of during the eclipse, I chose a sequence of nine whose images were separated enough that it was easy to see differences in the shadow progressions among them. I used a Canon 500mm/f4 lens with a Canon 2X extender on the same Canon 1Dx body. My exposures varied as the illumination of the moon changed but they ranged from 1/400 second at ISO 400 and f9 to 1/50 second at ISO 6400. I combined the finished images, evenly spaced, into a gentle arc in Photoshop and placed this arc on top of the city scene. I flipped the sequence and copied part of it for the reflection in the water, dropping the opacity slightly to make it look more realistic. This image prints nicely as an 11×17 and archival prints are available upon request. This entry was posted in Uncategorized and tagged composite, eclipse, moon.